These recipes first appeared in The Irish Independent’s Insider magazine on Thursday 5th June. We’re making the most of the last of the rhubarb season in the forkful kitchen this week. There are two types of this tart vegetable; forced rhubarb grown in pots and maincrop rhubarb grown outdoors. Both love living in Irish soil, which means we can enjoy forced Irish rhubarb in our late winter crumbles or maincrop Irish rhubarb in our spring and summer spreads right through to the end of June. We are very into making our own cordials at the moment. Who knew it was so simple? We were inspired by The Rocket Man, a purveyor of exquisite salads based in Cork City (find him on Twitter @rocketmancork) who also offers some seriously good cordials as an aside to his salads. Roughly chop the rhubarb into pieces and put into a large saucepan. Add the sugar, squeeze in the juice of ½ a lemon. Roughly chop the pieces of ginger and add to the saucepan before covering the lot with the water. The rhubarb should be just about covered. Bring to a boil and simmer for about 15 minutes until the rhubarb is all squishy. Remove from the heat and allow to cool completely. Use a good sieve to transfer the lovely, pink cordial syrup from the saucepan to a large bowl, leaving the chunky fruit bits behind. Use a funnel or a jug to transfer the cordial into a sterilised bottled. The cordial will keep for a few days in the fridge. 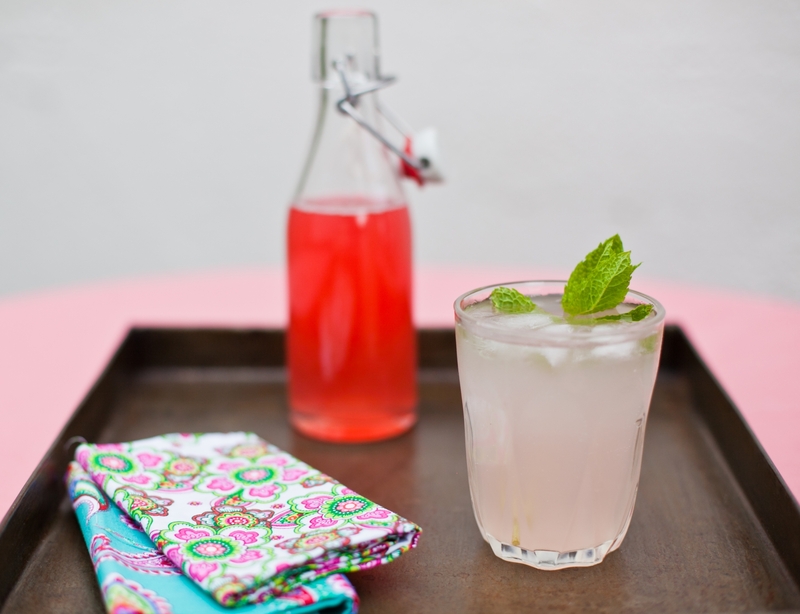 We dilute 1 part cordial with 2 parts sparkling water and serve it with lots of ice and a sprig of mint. Rhubarb’s tartness is usually covered up with a good dose of sugar but in this recipe we let it retain a little of its true flavour, allowing it to battle with the goat cheese for attention (we love St Tola Goat Cheese made in County Clare http://www.st-tola.ie/). Our reduced balsamic vinegar is the sweetner that brings it all together. Pre-heat your oven to 180c/160c fan/Gas Mark 5. Chop your rhubarb stems into pieces that are about 3 cm long. Arrange them on a roasting tray and scatter with a few thyme leaves. Drizzle the honey over the rhubarb. Add a drizzle of olive oil and a sprinkling of salt and pepper. Roast for 15 to 20 minutes or until the rhubarb is soft and cooked through. Meanwhile, make your balsamic vinegar reduction by pouring the balsamic vinegar into a small saucepan. Over a very low heat, stir and gently simmer until it thickens to a drizzle friendly consistency. This will take about 15 minutes and can’t be rushed so take your time with it. Toast four slices of your baguette before slathering them with goat cheese. 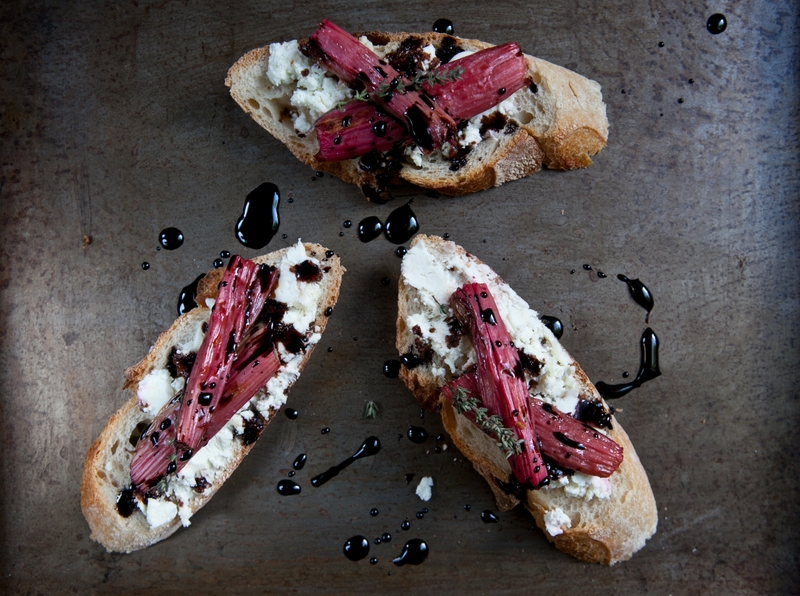 When your rhubarb is cooked through, top the goat cheese toasts with pieces of rhubarb and sprinkle with a bit more salt. Finish them off with a good drizzling of balsamic vinegar reduction.